The Change for Life baby bottle campaign is great for any church, church ministry or group of people who, as a family, want to help support The Center. Get involved by pledging to fill 8 oz. baby bottles with loose change, cash or checks to help raise money for women facing unplanned pregnancies. This is an easy and fun way to raise money for The Center. We provide the baby bottles and you can pick them up whenever you are ready. Your group selects the number of bottles that you would like, and when to participate. Most churches and groups participate for 3-4 weeks at a time. For more information, email: thecenterwf@gmail.com or call The Center at 940-322-4883. Many participate during our specific Change for Life Campaigns, but dates are flexible. To celebrate and promote the value of Life, born & unborn. 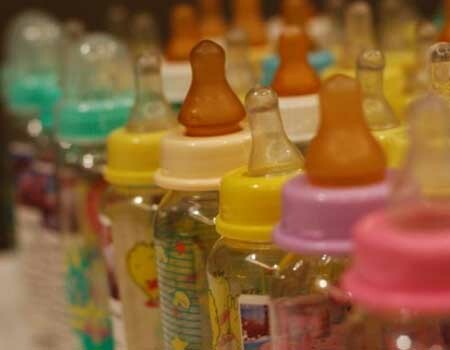 Church attendees are invited to take home empty baby bottles and fill them with currency, coins, or a check and then return filled bottles to their church. This is an opportunity for the families to have hands-on involvement in a project that saves the lives of unborn children and makes an eternal difference in the lives of women and families. Fill out a Baby Bottle Request form to let us know how many bottles you need. On a designated Sunday at your church or group, you make baby bottles available for families and individuals to take home and fill with coins, bills or even checks.About three or four weeks later, have them return the bottles to you on an announced date. You return the bottles to The Center, preferably with a check for the total amount you have collected. This is one of the easiest ways to collect funds to help save lives and protect futures. As you and your family fill up the bottle, say a prayer each time you drop in your change. This is a great ongoing reminder to pray for The Center as well a good reminder about how wonderful God is to create life and how you are making a difference to protect it. By distributing baby bottles, you and your church will assist us in saving and changing lives. please . We will have your bottles ready at The Center for you to pick up. Many people work with their church to have the Baby Bottle Campaign promoted by their pastor from the pulpit. We also have a short video that helps spread the word. Gifts received during Baby Bottle Campaigns are used to connect women in our community to life-affirming resources for their pregnancy, including pregnancy testing and ultrasounds, parenting education, material assistance and abortion recovery support, and also our newly developed STI testing program to promote health, wellness, and foster healthy relationships. Baby Bottle Campaigns not only help women and families – they strengthen and bless churches and the body of Christ as a whole as we partner together to see life cherished and supported at The Center in Wichita Falls and Vernon.